The PackSeat™ portable stool is a quick and easy way to “take a load off” – just about anywhere. The patented Shock-Cord Construction™ snaps the legs into place for set-up in seconds. For added strength and grounded leg stability, the PackSeat portable stool features a patented Anti-Splay Reinforcement Panel™. 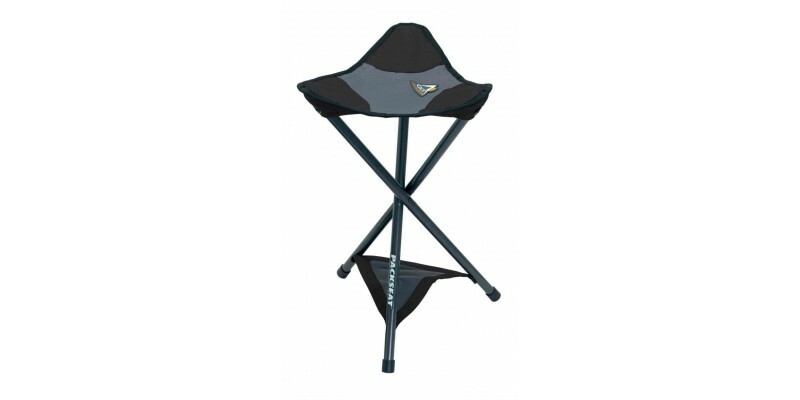 The PackSeat portable stool is constructed of sturdy, powder-coated aluminum and 600 denier polyester, which makes it ideal for any outdoor activity including camping, bird watching, hiking, fishing, traveling, sporting events and picnicking. Includes a carry bag with closure strap, buckle and carabiner for hands-free portability. Weighing in at only 26 oz, the PackSeat portable stool supports up to 250 lbs – over 150 times its weight! It measures 13” x 13” x 21” when open and folds to 15” x 4” x 4”. Available in black and midnight blue. Small and lightweight, the PackSeat can be attached to any bag or belt buckle by the handy carabiner or stashed in a tote or suitcase.